1. The third letter of the English alphabet. 3. The name of a programming language designed by Dennis Ritchie during the early 1970s and immediately used to reimplement Unix; so called because many features derived from an earlier compiler named ‘B’ in commemoration of its parent, BCPL. (BCPL was in turn descended from an earlier Algol-derived language, CPL.) 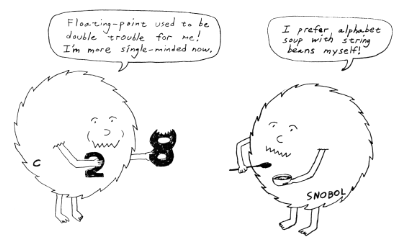 Before Bjarne Stroustrup settled the question by designing C++, there was a humorous debate over whether C's successor should be named ‘D’ or ‘P’. C became immensely popular outside Bell Labs after about 1980 and is now the dominant language in systems and microcomputer applications programming. C is often described, with a mixture of fondness and disdain varying according to the speaker, as “a language that combines all the elegance and power of assembly language with all the readability and maintainability of assembly language” See also languages of choice, indent style. The Crunchly on the left sounds a little ANSI.